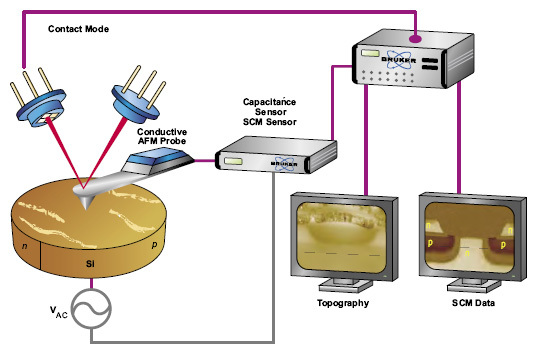 SCM uses contact mode AFM and a conductive probe and applies to semiconductor samples with an AC bias (amplitude DV, ~90 kHz) with a DC offset. The capacitance of the metal-oxide-semiconductor (MOS) capacitor at tip-sample contact is a function of majority carrier concentration in the sample. SCM uses an ultra-high-frequency (1 GHz) detector to measure tip-sample capacitance variation, DC, at the bias frequency. Sensor Signal is DC/DV. In feedback mode, output signal is DV, adjusted to maintain a DC/DV Setpoint. SCM maps relative changes of majority carrier concentration in semiconductors.